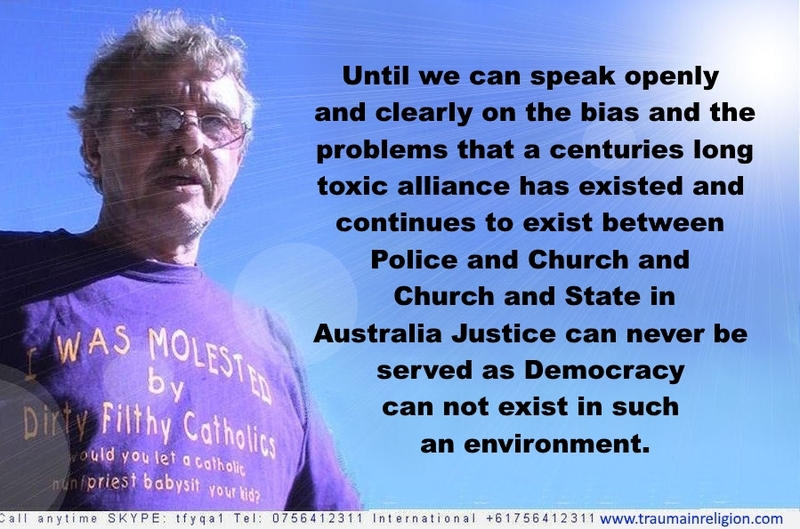 Please forward my message from a survivor of child sexual abuse and the cover up on behalf of all our children and the Australian community. My message to you with regard to involvement in child abuse and its cover in the Catholic Church is firstly directed at George Pell and then at the hierarchy and if necessary down the ranks to the everyday Catholic functioning in our society. Fix it and fix at in an exemplary example of a just, moral, ethical, human rights based equal way or bugger off with your failures out of our society as you are only an example of the most comprehensive moral failure of all those things we as human beings treasure the most - our children and our fellow human beings. Were there Catholics together with the dinosaurs? Why didn't they die out? Can I get my money back if I decide to opt out of heaven and hell? Do they have weather insurance in hell? Rain sure would be a killer there! If god created the earth in seven days why is he still creating suns and planets? God must be obsessional as he only needed to make just our solar system or perhaps just our galaxy - why is he wasting his time making the billion upon billion of others? Would that classify as an obsession when there are so many already? Why did god include the design flaw that allowed Catholics to come into existence? How does god explain priestly pedophilia? Or is he silent on it also? Will the church allow Google to provide a street view of heaven? Apart from supernatural beliefs I am not aware of any social systems that engage in ownership or mutilation of children at an early age. My research shows the Abrahamic religions to be the most obsessed culture with regard the ownership, mutilation and psychological control of children. The Catholic Church is a particularly well developed human trafficking come human sacrifice culture that requires the bonding of children to an entity outside the natural family; this is achieved through psychological trauma inflicted at the earliest possible moment in the child's life. People raised in these toxic cultures are very effectively trained to be adults that are in the control of their clergy or hierarchy through bribery, blackmail and other psychological and direct means to be silent or to even protect or fund child sexual abusers in their midst - this can only occur when the natural development of humans beings has been usurped or hijacked by superstitious beliefs and customs. In our culture this is unable to be seen as our systems are in the control of people raised in the environment as described above. Give me a copy of the DSM and together we can legitimize any of the more than 800 "brain diseases" and other diagnoses only because they are based on a notion of chemical imbalances (for which there is no empirical evidence to support such a claim) requiring pharma medication only so that you get to "enjoy" suffering until you as mindless and disconnected as your carer. Don't like the diagnosis? Simply visit another psychologist for a *different cherry-picked outcome based on a psychiatric manual (*schizophrenia, bi-polar, identity disorders and Anxiety are all mandatory for every diagnosis). Alternatively you can obtain an immediate clean bill of health through claiming belief in the mythical and monstrous Christian god. That must be so reassuring for them!